GotYourBack-U is a nationally certified NCBTMB Education Provider. Our education team includes instructors from diverse backgrounds in Massage Therapy, Chiropractic, Nursing, Acupuncture and Dance. Our workshops support the development of highly skilled practitioners who excel in their work. We offer flexible learning options and all classes include workshop material and student support through our on-line learning center. Attend a live class, shop in our massage store and network with other therapists. Flexible, on-demand learning saves time and makes your life easier. Optimize your practice! 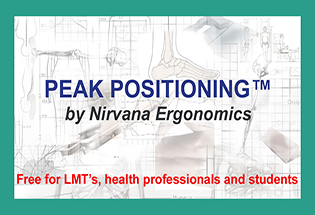 Learn PEAK Positioning for FREE! Mu-Xing Therapy tools and techniques will change the way you practice.